A good example of a choice Persian mehmooni table. Oh! Nothing much! Just a little table with a few little things to tide me over till it was time to munch on lunch! Let’s take a look from this angle too! This table looks good both coming and going! 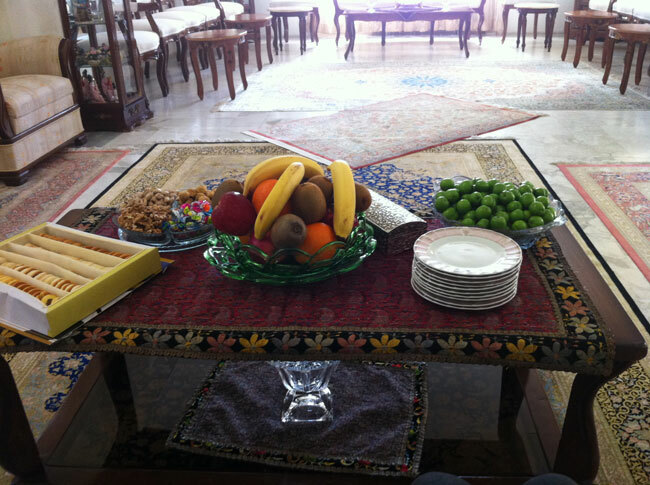 It behooves me to note that setting these kind of tables laden with fruit and assorted edible goodies to receive and welcome a visitor, be it just one person coming over or an entire clan, is part and parcel and in the very DNA of every single Iranian. This is what we do, people! An array of goodies to melt the heart & water the mouth! Here’s an aerial view of the mehmooni table. To the bottom left we have a choice box of assorted shirini Kermanshahi (be on the look out for these in the upcoming Kermanshah Grand Bazaar post!) Now, scoot your eyes slightly to the top and that’s a serving plate divided into compartments of goodies ranging from dried figs, pistachios, shelled walnuts and wrapped candy. Not bad, not bad! In the middle we have assorted fruits arranged into a pyramid shape which is THE classic and traditional way that iroonia (people hailing from Iran) serve fruit at parties. Just below the Persian pyramid of fruit we have a peek of my scarf/hijab cascading into the shot. Why I was still sporting my hijab inside is a mystery for the ages. To the right of that we have my red-espadrille-clad-feet peeking and sneaking their way into the shot. Which is a common hazard many food bloggers taking aerial shots experience. (And here you thought Persian-food-blogging was all fun and games and ta’dig.) Moving along past and above the red espadrilles, what do we have? Your eyes are not deceiving you, that’s a big bowl filled with many many many big and juicy gojeh sabz! Oh my! Dear green unripe plum: you are tart, delicious and an icon of nostalgia! After a suitable amount of picture taking of all the edible goodies, as is my sacred duty as your devoted food blogger, I commenced to gorge on gojeh sabz like a hungry savage BEAST. I continued to munch and take pix and be merry in this fashion all whilst my cousin Roshanak was slaving in the kitchen, preparing a veritable feast in the kitchen. True to old-fashioned Iranian customs, I was strictly forbidden to set foot in the kitchen or to lift even a finger! My sweet lovely uncle – who is officially the oldest (mash’allah & bezanam be choob) and thus the most respected member of the Houshiar clan – came to visit in this interim and seeing him was a feast as well. You know, for the soul. Awww! I know: SO CORNY! But: TRUE! Dudes, I mean it from the bottom of my refusing-to-be-jaded beating heart. The whole time I was stuffing my face and catching up with my lovely amoo, my cousin Roshanak was continuing to put the tantalizing finishing touches to her luncheon feast in the kitchen, with awesome-smelling things wafting their way into the drawing room. A few times I poked my face in the kitchen, practically begging to help, but I was unceremoniously shoo’d away. People: That is what Persians (aka Iranians) do as well! Ha ha! It’s true! I will share pix of the lunch (and other yummy foods in Kermanshah) in an upcoming post but for now let’s switch gears and turn our attention to these camomile flowers, growing wild in the mountains of Kermanshah, that I picked when I went koohnavardi with Mehran (another of my awesome cousins) and his family — account of which will also be the subject of an upcoming post as well. I saved the camomile flowers as a souvenir of an exceptional and beautiful outing and took them with me to Tehran and regret that I didn’t manage to bring them back with me to New York. Oh well, at least I have a photo momento and here they are, resting peacefully on Roshanak’s pretty Persian carpet. Speaking of pretty Persian carpets (by the way, practically everyone in Iran has carpets at home and the variety and beauty of the designs are stunning to put it mildly) I do have to say that I absolutely loved the silk Persian carpets in cousin Roshanak’s house. Gorgeous designs! Let’s take a quick look, shall we? The color green is a rare but prized choice in Persian carpets. I heart this pale pistachio green color. So beautiful! 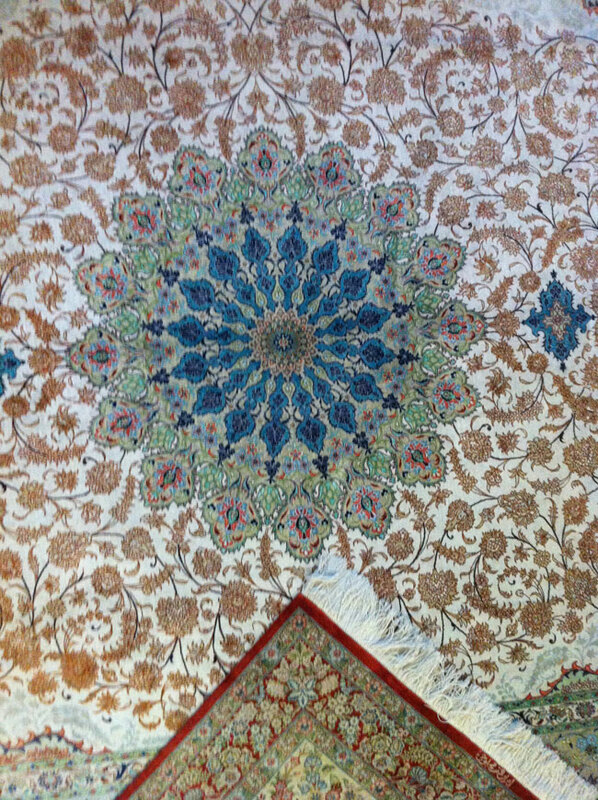 Here’s a blurry look at another pretty Persian carpet design. The pattern and colors in this particular Persian carpet make my eyes very happy! This is a hand-painted plate portrait depicting Mr. S (my cousin Roshanak’s esteemed and affable husband) riding one of his favorite horses. The artist is a friend of their family who specializes in decorative paintings from photographs. If you look at the 2:00 O’clock part of the photo, you may notice a crystal bowl — the designated nest of the pale pink Muhammadi rose petals harvested daily from Roshanak’s garden in their blooming season. Here’s a blurry shot of the roses atop a paisley-patterned termeh. Termeh is the term (no pun intended, ha ha) for a specific and prized type of Persian fabric that is used for decorative and festive occasions. Since we started this post with roses, let’s end with the account of these beautiful pink Muhammadi roses as well – the very breed of roses that are used to make rose water. For 10 or so days, the several rose bushes in Roshanak’s yard bloom profusely, and every day of those days, Mr. S harvests the blooms and keeps the petals in a bowl as a beautiful potpourri till they dry out and then Roshanak uses the dried petals to crush and garnish doogh and mast ‘o khiar as is the custom in the Persian cooking tradition. I loved being in Kermanshah in the rose season (although that meant I missed the barberry and quince season) witness to such charming rituals, and truly lucky to spend quality time in the company of my lovely cousin Roshanak and her awesome husband Mr. S (the master of daily rose-harvesting ceremonies) who were such incredibly thoughtful, generous, gracious and delightful hosts in every way possible way — and in ways that they really shouldn’t have! They really spoiled me! But: no complaints! In fact, here I am, a year later and I’m still charmed. Hope you are as well, vicariously! Stay tuned for more upcoming Kermanshah posts … I’m just getting started! Thank you for taking me to Iran!! What fabulous culture, art and food. I loved the Persian carpets, I can call myself to have a small one in my house, though a different kind. I know I’ve said this a number of times, but I would love to go there with you for real! Azita, oh I know you have said numerous times and that so sweet of, my comment was just a matter of speech enjoying your post. You are so very kind. Really nice and authentic reporting of Iranian life ! This is a gorgeous post. What beautiful patterns and flowers and fruits. So much beauty. I’d love to visit Kermanshah if I have the chance to travel to Iran again (I hope I will!). And that blue carpet… so gorgeous! Well, all of them! This is such a beautiful post…I can’t stop looking at the pictures. Kermanshah sounds like such a beautiful place.